Today’s corporate leaders must not only deliver operational excellence and winning strategy, but have strong ethical and professional values, and a commitment to good corporate governance. The new King IV Report on Corporate Governance, issued by the Institute of Directors in Southern Africa (IoDSA), brings the role of ethical and effective leadership to the fore. According to this latest version of the King code – released in November – while leadership starts with each individual director, it finds its expression through the board as a collective, setting the appropriate example and tone. King IV explains the governance of ethics as the role of the board in ensuring that the ethical culture within the organisation is aligned to the tone set by the board through the implementation of appropriate policies and practices. Other important issues covered by King IV include the wage gap, shareholders voting on remuneration policies and their implementation so as to trigger engagement with the company and the composition of the governing body. King IV now proposes that companies establish a clear link between performance and remuneration; it will be necessary for the remuneration committee to consult with the social and ethics committee when a determination is made on the fairness and reasonableness of executive remuneration. The issue of shareholders voting on remuneration policies has also come under focus in the UK, with BlackRock – the world’s largest asset manager – threatening to unleash a wave of shareholder rebellions in the UK unless Britain’s largest companies rein in excessive boardroom pay. Total pay for bosses of FTSE 100 companies has quadrupled over the past 18 years as repeated efforts by shareholders to control escalating remuneration awards have failed. BlackRock’s tougher stance on executive pay is detailed in a letter sent to the chairmen of more than 300 companies in the UK. In it, BlackRock says it considers misalignment of pay with performance as an indication of insufficient board oversight, which calls into question the quality of the board, and that it believes that shareholders should hold directors to a high standard in this regard. Executive pay should be strongly linked to performance, meaning strong and sustainable returns over the long-term, as opposed to short-term hikes in share prices. 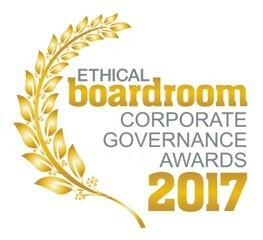 Ethical Boardroom is proud to announce the winners of “Best Corporate Governance” in their respective industry sectors across Europe & Africa for 2017. The awards recognise the outstanding leadership from boards of public companies who have raised the bar to ensure that strong corporate governance plays an essential part in protecting and enhancing long-term value for all stakeholders. Our awards program is a vital part of our continuing mission to elevate corporate governance standards globally. Best Corporate Governance Construction Vinci S.A. Please note that the winners for the Middle East region will be announced in the Spring 2017 edition.